I really enjoy travel, whether for work or pleasure (or even better, combining work and pleasure). When I first visited Kuala Lumpur, Malaysia, a few years ago, I was immediately attracted to this vibrant capital city. There was so much to love: the diverse architectures and neighborhoods, ranging from some of the tallest buildings in the world to bustling local shops and outdoor stall markets. The diversity of languages, interests, and foods, drawing on a wide range of cultures, geographies and backgrounds. The number and energy of young people everywhere I went, and the courtesy and friendliness of all the people I met. The easy transit system. The lush greenery, deriving from the tropical climate just 3 degrees north of the equator. Malaysia is indeed an interesting and nice place to be. Lucky for me, with my very limited grasp of languages, one of the official languages is English, so I could navigate “KL” easily, even when left to my own wits. Malaysia also boasts a solid actuarial profession, and a well-developed actuarial association (Persatuan Aktuari Malaysia, or the Actuarial Society of Malaysia, ASM). My first visit to KL was in connection with the inaugural joint general insurance (property/casualty) seminar being organized by ASM, the CAS , and the Institute of Actuaries of Australia. ASM and its members clearly had a vision for a strong future. The regulatory authority, Bank Negara Malaysia, also conveyed to us a vision that included key roles for general insurance actuaries. But something was a bit disappointing during that first visit in 2014: the insurance company executives I met, while acknowledging that they might have a general insurance actuary or two on their staff at some point in the future, did not express much of a compelling or immediate business purpose for those staff actuaries. What a difference a few years make! The insurance marketplace is now singing a different song, as highlighted and explained in the Actuarial Review article about our most recent joint general insurance actuarial seminar, conducted in December 2017. Senior insurance company executives, whether presenting at the seminar or chatting with us privately, all spoke urgently about the current and upcoming demand for actuaries to work on loss reserving, solvency and capital management, pricing, and product development. The regulators also highlighted that the need for general insurance actuaries far exceeds the supply, and expressed the hope that some experienced actuaries from other parts of the world might consider exploring the opportunities in KL, whether at the companies or in the regulatory authority. Several universities have ramped up with very energetic and ambitious undergraduate actuarial programs, and are hungry to increase the general insurance content that they deliver to their students – but of course they also recognize that the students they educate will not meet the near-term need for experienced practitioners. In short, there is a significant need, and a hunger, for general insurance actuaries with enough experience to take on important responsibilities and to lead important projects. There is a need for actuaries who are equipped not only to do the technical work, but who also can work closely with other members of the management team, and who can communicate effectively about the business implications of the actuarial analyses. There is a need for actuaries who can build the teams, and the data and actuarial infrastructure that are required. And finally, there is a need for thoughtful, energetic, and creative actuaries to work within the regulatory authority and to teach at the universities. If you would like to have a significant role in shaping the business strategies, product designs, marketing game plans, and pricing systems of insurance companies that are facing the opportunities and threats of a marketplace with new opportunities for product innovation, pricing differentiation and growth across the motor insurance and property insurance spectrum. 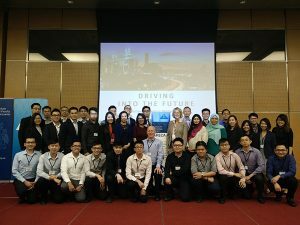 If you are ready for a seat at the table with other key decision-making executives; and if you are excited at the prospect of helping define the products, services, pricing structures, loss reserving practices, reinsurance structures, and capital management approaches for the Malaysia insurance and takaful marketplaces of the future. If you would like to participate in the growth and development of the actuarial profession in Malaysia, and to be a part of this vibrant community of practitioners as it moves enthusiastically into the future. If you are open to a personal adventure of living and working in a different part of the world, or ready for the comfort of returning to a place where you have family roots. Read the recent Actuarial Review article about the 2017 seminar, and revisit the earlier article about the prior seminar. Come to the CAS Spring Meeting in Boston this May, and attend the session “Livin’ the Dream” that will focus on the role of the actuary in navigating some of the exciting and challenging competitive opportunities that are emerging in Malaysia as well as elsewhere in the region. Participate in informal conversation during the CAS Spring Meeting with the speakers for this session. We plan to organize and announce a time and place for such conversations, and I invite you to come talk, ask, and listen. We are very fortunate to be working in a truly global profession. My work with actuaries in other countries has provided some of the most special moments in my career. I hope that your journey also will create some special moments that you can share with all the rest of us! Bob Conger is the CAS’s International Ambassador. He is a Fellow of the Casualty Actuarial Society, a Member of the American Academy of Actuaries, and an Honorary Fellow of the UK Institute of Actuaries. He is a Past President of the CAS, and also served the CAS as Chairman of the Board, as Vice President-Administration, VP-International, and as an elected Board member.